Gigabit Ethernet modules delivered the predictable performance for bandwidth in aggregation and core layer. The Cisco Catalyst 6800 and 6500 Family Switches offer a variety of 10-Gigabit Ethernet modules recently. These 32-port cards will help us to make the transition from 1-Gb to 10-Gb through line card which will installed in the same boxes. These gigabit ethernet modules provide an advanced network service that will fulfill your all needs. 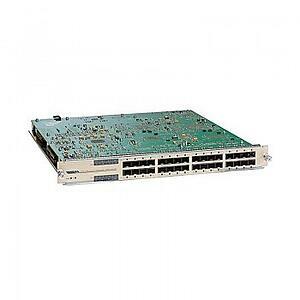 The Cisco Catalyst 6800 Series Switches offer a variety of 10-Gigabit Ethernet line cards. Which will work in conjunction with the Catalyst 6500-E/6807-XL Supervisor Engine 2T/2TXL (VS-S2T-10G & VS-S2T-10GXL). They can achieve different needs on campus and access layer deployments. Cisco provides the three modules as each client requires. 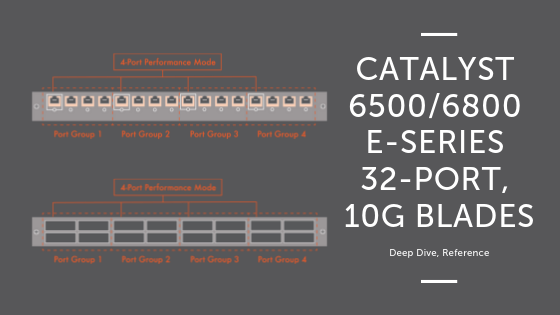 The Catalyst 6800 32-port, 16-port, and 8-port 10-Gigabit Ethernet Fiber Modules for fiber connectivity. The 10-Gb modules are based on the WS-X6804-40G module. Providing the same level of industry standard features. Also providing high bandwidth performance at distribution and core layer of Campus. All the 10-Gb modules include hardware features such as Virtual Switching System (VSS), Instant Access (IA), Location ID Separation Protocol (LISP), Security Group Tagging (SGT) and Access Control (SGACL), MACsec (802.1ae), traffic shaping, and hierarchical quality of service (HQoS). The line cards are also the first to launch with front-facing passive UHF and RFID technology, providing the latest Auto-ID capabilities for asset management. 2.) Over-utilization of ports (trying to push more traffic). Note that these modes affect port groups rather than individual ports. By default, the module operates in oversubscription mode. The mode of operation can be changed by Cisco command line for each eight-port port-groups (mixed mode) and is described in more detail in the following sections. Note that the 8-port 10 Gigabit module always operates in performance mode only. The C6800 32-port 10-Gigabit Ethernet Fiber Module is built for deployment in all campus aggregation and core layers of the networks. There are two types of 32-port 10-Gb fiber modules. The specification of backplane connection, Chassis support, Supervisor engine, and distribution performance. A description is given below. Two models: C6800-32P10G, a 32-port 10-Gigabit Ethernet Fiber Module with DFC4 (see Figure 1), and C6800-32P10G-XL, a 32-port 10-Gigabit Ethernet Fiber Module with DFC4XL. 160-Gbps backplane bandwidth in 6807XL; 80-Gbps backplane bandwidth in 6500-E chassis. Chassis/ slot support: Can occupy slots 1-2 and 5-7 in a Cisco Catalyst 6807-XL. Can occupy any slot in Cisco Catalyst 6503E, 6504E, 6506E, 6509E, and 6509-V-E. Can occupy slots 1-6 and 9-13 in a Cisco Catalyst 6513-E. Supervisor engine: Compatible with Supervisor Engine 2T and Supervisor Engine 2TXL. Distributed forwarding and performance: Comes equipped with factory-installed dual (2) DFC4-E or DFC4-EXL daughter cards. The C6800 Family 32-port 10-Gb Ethernet Fiber module can provide up to 160 10-Gb Ethernet fiber ports in a single Cisco 6807-XL chassis. Or up to 320 10-Gb Ethernet fiber ports in a Cisco Catalyst 6807-XL Virtual Switching System (VSS) 2T. It also provides up to 352 10-Gb Ethernet fiber ports in a single Cisco Catalyst 6513-E Switch chassis, or up to 704 10-Gb Ethernet fiber ports in a Cisco Catalyst 6500 VSS 2T. The C6800 16-port 10-Gigabit Ethernet Fiber Module is built for deployment in all campus aggregation and core layers of the networks. There are two types of 16-port 10-Gb fiber modules. The specification of modules models, backplane connection, Chassis supported, Supervisor engine and distribution performance. A description is given below. Two models: C6800-16P10G, a 16-port 10-Gigabit Ethernet Fiber Module with DFC4 (Figure 2), and C6800-16P10G-XL, a16-port 10-Gigabit Ethernet Fiber Module with DFC4XL. Backplane connection: 80-Gbps backplane bandwidth in Catalyst 6807-XL and 6500-E chassis. Chassis/slot support: Can occupy slots 1-2 and 5-7 in a Cisco Catalyst 6807-XL. Can occupy any slot in Cisco Catalyst 6503E, 6504E, 6506E, 6509E, and6509-V-E. Can occupy slots 1-6 and 9-13 in a Cisco Catalyst 6513-E. Distributed forwarding and performance: Comes equipped with a factory-installed DFC4-E or DFC4-EXL daughter card. The C6800 Family 16-port 10-Gb Ethernet Fiber Module can provide up to 80 to 9010-Gigabit Ethernet fiber ports in a single Cisco 6807-XL Switch chassis. Or up to 160 to 170 10-Gb Ethernet fiber ports in a Cisco Catalyst 6807-XL Virtual Switching System (VSS). It also can provide up to 176 10-Gb Ethernet fiber ports in a single Cisco Catalyst 6513-E chassis or up to 352 10-Gb Ethernet Fiber ports in a Cisco Catalyst 6500 Virtual Switching System (VSS) 2T. the C6800 8-port 10-Gigabit Ethernet Fiber Module is built for deployment in all campus aggregation and core layers of the networks. There are two types of 8-port 10-Gb Fiber Modules. The specification of backplane connection, Chassis support, Supervisor engine, and distribution performance. A description is given below. Two models: C6800-8P10G, an 8-port 10-Gigabit Ethernet Fiber Module with DFC4 (Figure 3), and C6800-8P10G-XL, an 8-port 10-Gigabit Ethernet Fiber Module with DFC4XL. Chassis/slot support: Can occupy slots 1-2 and 5-7 in a Cisco Catalyst 6807-XL. Can occupy any slot in Cisco Catalyst 6503E, 6504E, 6506E, 6509E, and 6509-V-E. Can occupy slots 1-6 and 9-13 in a Cisco Catalyst 6513-E. The 8-port 10-Gb Ethernet Fiber module provides us up to 40; 10-Gb Ethernet fiber ports in a single Cisco 6807-XL chassis or up to 80; 10-Gb Ethernet fiber ports in a Cisco 6807-XL Virtual Switching System (VSS) 2T. It also provides us up to 88; 10-Gigabit Ethernet fiber ports in a single Cisco Catalyst 6513-E Switch chassis or up to 176; 10-Gb Ethernet fiber ports in a Cisco Catalyst 6500 Virtual Switching System (VSS) 2T. The Cisco 6800 Family 32-Port and 16-Port 10-Gb Fiber Module can act in performance mode to provide line-rate operations. The 8-Port 10-Gb Fiber Module can provide line rate by default. You can only achieve performance mode in 32-port and 16-port Fiber module. There is no performance mode in 16-port 10-Gb fiber module. In performance mode, only the first port of the port group is enabled, and that port comes with enhanced buffering and quality-of-service functionality. The other 3 ports in the port group will be administratively shut down. The new 6800 series 10-Gb Ethernet modules have two 20-Gbps connections to the fabric. The Distributed Forwarding Card 4 (DFC4) can forward traffic up to 60 Mbps campus environments. The total forwarding performance of a fully installed 6513-E chassis with 6800 Series 10 Gigabit and Gigabit Ethernet modules is 720 Mbps (11 available slots for line cards with slots 7 and 8 reserved for Supervisor Engine 2T). 1.) For the 32-Port 10-GbEthernet Module, ports are from left to right. The top row consists of odd number ports and the bottom row consists of even number ports.